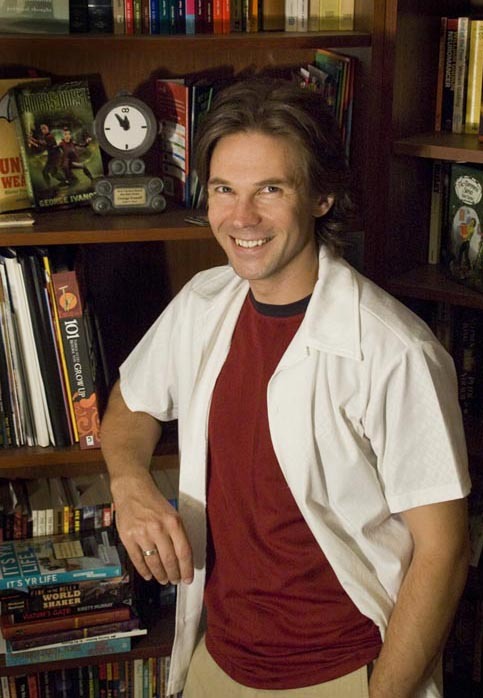 Today, I’m talking with children’s and YA author George Ivanoff. George’s novel, Gamers’ Quest, has just been released by Ford Street Publishing. George, can you tell me how you first came to be published? It happened slowly. Throughout the 1990s I was writing for amateur publications, while also sending out stories to professional markets and building up my collection of rejection letters. Then one day I hit the right publisher with the right story at the right time. I got a phone call. They wanted to see more. I sent them more. Next thing you know I have a book of short stories — Life, Death and Detention (Margaret Hamilton Books, 1999). At around about the same time, I discovered the education market and wrote my first education book — Real Sci-Fi (Horwitz Martin, 1999). I discovered I had a knack for writing for this market and I continued to get more education books. A couple of years ago I was able to give up working a day job and concentrate on my writing. I see you’ve had lots of short stories for kids, teens and adults published. Was this part of a deliberate strategy to develop your career as a writer? Yes and no. I’ve always loved short stories and have been writing them for years. As a format it forces you to cut the waffle and get straight to the guts of the story. But yes, I did make a conscious effort to submit some stories to some high-profile anthologies, to get my name out there. Did having the short stories published help you when you approached publishers about your novels? No! Gamers’ Quest is my first published novel and it went through a different processes. As for my earlier unpublished novel, the short stories haven’t helped me sell it yet! How did you approach the education publishers you’ve worked with? I’ve approached education publishers in two ways. The first method is simply that of looking up their websites, seeing if they publish the sort of material I could write, and then emailing… “Hey there. I’m a writer. I could write for you. Call me!” This method has worked on a few occasions. The second method is that of networking. My first education book was through the recommendations of a friend. And since then, I’ve gotten a fair bit of work simply by meeting people and being nice to them. As a writer, what qualities are required for writing fiction and non-fiction for the education market? You need to be able to work to a brief and you need to be able to meet deadlines. Briefs can be very specific. Things like word-count and age-level are easy enough, but sometimes the requirements of the text can be a challenge. Sometimes the requirements are simple, like “we want a story about a magician” or “we need a super-hero story”. Other times, they get more specific. I once got a brief wanting a fiction book dealing with self-esteem and positive older role models. The result was House of Cards, a story about a bullied kid who is interested in being a writer, but lacks the self-confidence. He strikes up a friendship with an elderly author who gives him the confidence to pursue his dreams. And the author also learns that she still has a lot to offer the world. What are the differences between writing for the education market and trade? The main difference is that the education market is brief-driven. An education title is not normally published in isolation — it’s usually part of a series of books, each with a different author. So you need to write something that fits in with the rest of the series…which is why you get a brief. With the trade market, you can write whatever you want. But then you have to try and sell it to a publisher. Do you come up with the ideas for the non-fiction books or does the publisher commission you? Education books, non-fiction and fiction, are usually commissioned. There have been a few exceptions along the way. I wrote a few books for graded reading series of fiction chapter books called Fast Forward. This was a competitive process. For each level, the editor sent a brief about style, word-count and grade level to a whole bunch of authors. The genre and topic of the stories were up to the authors. Then the editor would pick the 5 stories that best suited the needs of the series. All up I made 10 submissions, selling 5 of them. How did you come to be published in New Zealand? This was something I initiated. I read a note in a writers’ newsletter that mentioned a publisher in New Zealand was looking for authors to write books for reluctant teen readers. I contacted them, pitched an idea and was contracted to write Cory Jansen – Teen Spy. It was a set of 5 chapter books. Each book was a small story in its own right, but also part of a larger story. So it’s actually a short novel split into five non-threatening, slim chapter books. I was very pleased with these books. They were very nicely designed and the comic-book style of illustrations, from artist Christian Schwager, were perfect. Were there any difficulties working with an overseas publisher? No difficulties. I do most things via email these days, so it makes no difference where the publisher it located. Do you ever encounter obstacles (in terms of craft) when writing for publication? If so, how do you address them? Well, there’s always the occasional bout of writers’ block. And it’s often not that I don’t know what to write, but that I just can’t get it out. I find the best thing to do is just leave it for the moment, go do something else, like the washing or the cooking, and then come back to it later. What do your publishers expect from you in terms of rewrites? This can vary greatly. Often, with educational publishing, I’ll submit a manuscript, get some feedback, re-write and re-submit, and that’s it. An editor will go through it later with a fine-tooth comb and make any necessary amendments. With trade publishing there is a lot more back and forth happening. Gamers’Quest went through 9 drafts. I started with an outline and sample chapters, which the publisher gave me some feedback on. I then wrote 5 drafts of the novel before submitting it. The publisher then gave me some feedback and I re-wrote it. He then gave me some more feedback and I re-wrote it again. Then the editor went through it in great detail and I did another draft. Then the publisher gave me some more feedback and I did the final draft. But through the design and proofing stage a few more little amendments happened. Do you do book proposals for your books? I do for the education books. After receiving the brief I will write a proposal. Then, based on the proposal, the publisher will commission me…or not. Tomorrow, George talks about how he moved from writing for education publishers, to working with Ford Street Publishing. He also discusses his book launch and signings. Click here to visit George’s website.